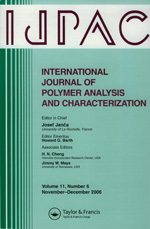 Papers based on the invited lectures, contributed lectures and posters presented at ISPAC-2012 may be submitted for consideration in a special Symposium issue of the International Journal of Polymer Analysis and Characterization (IJPAC). Contributions, which will receive a peer review, will be accepted by the Editor-in-Chief of IJPAC, Prof. Josef Janca (ijpac@ft.utb.cz). For submission of manuscripts/instructions of authors, see the journal's webpage. The special issue will be published as soon as possible, with a target in late 2012 or early 2013. Contributions should not exceed 15 pages double-spaced using font Times Roman 12pt, including figures, tables, and references. There is no deadline for manuscript submission in IJPAC (to be considered for this symposium issue).